Computer paired. NWSRS rated, no membership required. 8:30am - Registration opens. Note: All pre-registrants must check in. Players who check in late will be receiving a half-point bye in round one. 8:50am - Deadline for 6th-12th grade players to check in. 9:10am - Deadline for K-5th grade players to check in. 3:40pm or asap - Awards ceremony for K-1, 2-3, 4-5th grade sections. 5:45pm or asap - Awards ceremony for 6-12th grade section. Can't play in all rounds due to other commitments? You can still play in Chess Jam! See the FAQ below. Awards: Trophies to the top three in K-1, top five in 2nd-3rd and 4th-5th grades, and top seven in 6th-12th grade division. Also trophies to the top five in 6th-12th grade Premiere (lower half) division. Medals to those scoring 3.0 or higher. Every K-1 player who completes all five rounds will receive a medal or trophy. Upset and Unrated awards. Sweet awards to top three elementary schools (determined by adding the points of the top five scorers from a single K-5 school). Sweet prizes to top three schools in the 7th-12th grade division (based on top four players). Random riddle door prizes in the K-5 division. Tiebreaks by computer. Ferndale Elementary Championships: Chess Jam incorporates the Ferndale Elementary Schools Championships, and additional awards/titles will be presented to the top Ferndale K-5th grade students. Players must register in advance. Register online at the BYC Registration Page before 7 pm Friday, April 12. Canadian players: Please enter online, and also email us with the player's grade, ratings and school attended. Thanks! Director: Randy Kaech, 36O-255-Ol84, kaechster@gmail.com. If I submit a riddle for the door prize, will you read my name? We'll be reading some of the riddles between rounds, but we'll only read your name if you are a prize winner. I can't play in all five rounds because I have to be somewhere else for awhile that day. Yes, you can still play in Chess Jam! Tell us which rounds you will be missing when you check in. You'll get a free 1/2 point bye for each of the first two rounds you need to miss. So what's the schedule for each round? Players meeting 9:15, Rd 1 9:45, Rd 2 10:55, Rd 3 12:05, Rd 4 1:15, Rd 5 2:25. Awards around 3:40pm or ASAP. Rounds may be moved up. Schedule for 6th-12th grade section: Rd 1 9:15, Rd 2 10:55, Rd 3 12:35, Rd 4 2:20, Rd 5 4:05. Yes there will. Goodies from the bakery will be available for brunching, and you can pre-order lunch also. I don't even know how to play chess. Is it hard? I'm not a good chessplayer. Should I play in Chess Jam? Sure! Come jam with the rest of us patzers. 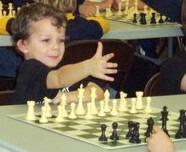 We're all learning, and you don't have to be a Grandmaster to have fun at chess. Besides, the Swiss pairings system will match you with opponents of equal ability (after a few rounds). And just think of how much better you'll be after a day of chess jamming. Do I have to write down the moves? 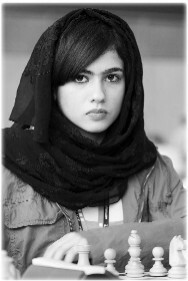 At Chess Jam scorekeeping is required in the 6th-12th grade section . To learn how, have a teacher or friend show you, or go here. Hey, it's good for you! One of the best ways to improve is to review your games after a tournament. (Besides being able to show your friends the awesome move you made that clinched the game.) Also, learning chess notation opens you to the whole wide world of chess literature. So, bring a pen or pencil, scoresheets will be provided. If I haven't taken my hands off of the chess piece yet, can I change my mind? In a rated tournament like this one, if you even touch a chess piece, you must move it! And if you touch an opponent's piece, you must capture it! So sit on your hands until you know what you want to do. If a piece needs to be centered or adjusted, you may do so by first saying "I adjust". Will we use chess clocks? How do they work? We'll use clocks in the 6-12 section, and in the lower sections on the upper boards only, and if your game goes really long. Chess clocks are a great invention. They keep slow players from slowing and losing players from stalling. Here's how it works: After your move, you hit the button nearest you on the chess clock. Your timer stops, and your opponent's timer begins. In this tournament each player gets either 30 minutes (K-5 section) or 45 minutes (6-12 section), thus ensuring that no game goes over 60 minutes (or 90 minutes). If a player uses up all his time, it's a loss just like checkmate. If a game starts without a clock and goes really long, we may put a clock on the game, with the time equally elapsed, as one becomes available. How do school team awards work? The team scoring used will be similar to cross-country meet scoring. The best five results from a single K-5 school will be tallied and compared with other schools. (Best four results in 6th-12th grade division.) Efforts are made not to pair players from the same school. Eligibility rules are those used by WHSCA for State events at the MS and HS level, and at Elem. level we use the eligibility rules used at Elem. State. The 6th-12th grade section uses McMahon Swiss pairings. What's that? The 6th-12th graders generally have ratings that are more established than in the elementary sections. So we're using McMahon Swiss pairings, which allows players of similar strength to play each other sooner, and avoids first round mismatches (i.e. having to play someone 600 points higher/lower than yourself). It's the same as a regular Swiss tourney, except players in the top half of the field begin the tourney with a point. With McMahon, top half players play each other starting in the first round rather than the second, as do lower half (Premiere) players. It's as if the tourney began with one round already played. (Don't worry - you still get to play five games!) It's used regularly in Go tournaments. Trophies are awarded for top performances in the Premiere section. Is this tourney an Elementary State Qualifier tournament? Tell me about State. The largest chess tournament in the state every year is not the Washington Open, the Seafair Open or the State High School Team Championships, it's the State Elementary Championships. For example, a few years back 1,422 players pre-registered to compete in Redmond. And consider this: to attend, players had to first qualify by posting a winning record in a qualifying tournament! To qualify for Elementary State, a Washington student in grades 1-6 must post a winning record (score over 50 percent) in a NWSRS-rated Scholastic Chess Tournament in Washington State with at least 4 rounds, at least 6 players in their section, and at least 3 different school codes represented. Players in Kindergarten need to score 2/5 in a divison which includes K-2 players. You can find more information at 2019 Elementary Chess State.